These days, Mutual funds have become the best investment choice for the investors because the mutual funds solely take the responsibility of the investor’s money to grow their capital in the long or the short term. It has also become the Best investment option for females. You just have to pool a part of your income to the mutual fund house of your choice and then these MF houses invest your money in various sectors or various capitalized markets, as per your requirements to gain the benefits in the form of returns. But, do you have any idea that how these investments ideas and respective returns on them are linked with the market economy? Or in simple language, where your money is invested and how you come to know that whether your money is growing its value in the market or its value has become even more down? The answer is here in the article. This article is made to deliver you some basic knowledge about the Share market and hence it is a little time-consuming also. But once you understood the concept, you will understand the whole trade market phenomenon. How to Earn Money From Share Market? How to make Intraday trading? 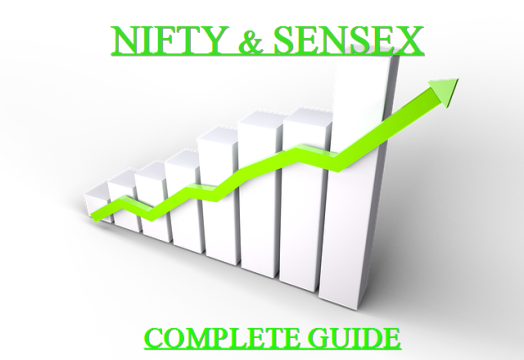 This article is designed to give you an understanding of Nifty and Sensex. Let’s begin to know What is Nifty and Sensex? In order to know nifty and Sensex meaning, you need to be well-known with Indian stock exchanges first. The Bombay Stock Exchange is a group name of 5500 companies where these companies trade their shares among each-other. The BSE trades in equity, debt, and mutual fund derivatives. It was established in Mumbai in 1875 and it was recognized as the exchange under the Securities Contracts (Regulation) Act in 1957. It acts as a regulator in the Indian stock exchange market for supervising the irregularities and manipulations in the stock price. Asia’s oldest Stock exchange, the BSE has become the 11th largest stock exchange globally with an overall market capitalization of 601275.75 crores as of September 2017. Sensex, also called BSE 30, is the market index consisting of 30 well-established and financially sound companies listed on Bombay Stock Exchange (BSE). When the 5000+ companies under the BSE are categorized or divided into groups, they take a different name. So when a sample of 30 companies is taken out of these 5000+ companies, it becomes BSE 30. Now, you must be thinking that what is the role of this BSE 30? You know that there is an unlimited number of various kind stocks in the market whose value keeps on increasing or decrease as per the market fluctuations. It is typical to evaluate these stocks individually and calculate the stock value of each. So what the BSE has done is that it has chosen top 30 companies out of his total firms that belong to different sectors and also they are performing very well in the country. This is a process of taking out a sample to bring the value of every stock in the whole market. This is just like what you see in the national surveys. The average value of stocks of these 30 companies together derived becomes the index value and that index value in the terms of BSE is known as the SENSEX. I hope you have understood till now. Now come to the point that how is this SENSEX calculated? The total number of shares available only to the public, excluding the promoters, government/ trusts, FDIs etc. Suppose the index has two companies – X and Y. Company X has 500 shares out of which 300 are free-floating or available for the general public to buy and sell. The price of each share is Rs.80. Let us assume the base year index was 5000. So the Value of the Index is 1880. This is how; we came to know whether the companies are able to perform well or not. If yesterday’s SENSEX stopped in 2000 and today it is 1880, then, it means that the companies SENSEX value has gone down and that means that companies are not returning well. And if today’s SENSEX is 1880 and tomorrow it will stop at 2000, then it means that the companies SENSEX value has gone up and that means that companies are performing well and will return well. What are the Highs and Lows of Sensex in the last 10 years? The Sensex is the result of economic fluctuations due to political, legal, and market operations across the world. In the last 10 years i.e. from 2007 to 2017, the Sensex go through various value fluctuations. During the 10 years, the year 2008 shows the lowest Sensex value which was 15000. It was due to the stock markets in the U.S. which started crashing and there were major credit losses in the U.S. The highest points were reached in August 2016 and March 2017 which values around 3000. The stocks are selected based on a lot of qualitative and quantitative criteria’s. The BSE includes only those companies which are performing very well and have large capitalization in the market. These companies are representative of many industries operating in the trade market. The companies which maintain a balance among its handsome returning rates and assets under management with an appreciating risk appetite factor enjoy a long-term listing under the BSE. If a company has lowered down its performance in any year, then it is exempted from its involvement in the list. How can I use SENSEX to aid my investments? The question here is how you can take advantage of the SENSEX for growing your investment or taking your investment decision & How to invest in Share Market for Beginners? See, it will depend on the Sensex value. If the Sensex is rising or dropping, means fluctuating frequently at the time, then it is advised to you to wait for some time until that fluctuation becomes steady. As soon as the Sensex comes to its steady value, then you should invest in the stocks of companies. Generally, the stocks of blue chip companies sound well in performance. Blue chip companies are the companies which are top companies listed in BSE. BSE is a self-indicator of the companies which are performing well in the economy. This will help in prudent decision-making in your finances. It is well-known and one the leading stock exchange of India. NSE was set in the year 1992 as the first demutualized electronic exchange in the country. It was the first exchange in the country to provide a modern, fully automated screen-based electronic trading system which offered the easy trading facility to the investors spread across the length and breadth of the country. NSE has a total market capitalization of more than US$1.41 trillion, making it the world’s 12th-largest stock exchanges of March 2016. NSE’s index, the NIFTY 50, is used extensively by investors in India and around the world as a barometer of the Indian capital markets. Nifty is a benchmark index for the Indian equity market. As the Sensex shows the indicator value of BSE performance, in that similar way, NIFTY is the performance indicator of the NSE. It acts as the barometer of Indian Capital markets to understand the performance of stocks. NSE is the National Stock Exchange which was established in the year 1992 to become the first electronic exchange in the country providing a modern, fully automated screen-based electronic trading system. It is a leading stock exchange which has an index known as NIFTY. The NIFTY full form is National Stock Exchange Fifty. Fifty indicates that there are 50 companies/ stocks inside the hood of NSE. It is also known as CNX 50. Nifty was introduced by the NSE. It is broader than the Sensex, which has only 30 stocks within it, while the Nifty has 50 stocks under its hood. The base year of Nifty is taken as 1995. It indicates that initially, the Nifty was started in 1995. The base value is 1000. It shows the initial index value when nifty was first time established. The 50-stocks indicate the top stocks in the market which are selected from 24 different sectors. If Nifty goes up, this means that the stock price of most of the major stocks on NSE has gone up. If Nifty goes down, this tells you that the stock price of most of the major stocks on NSE has gone down. Adani Ports HDFC Bank Ltd. NTPC Ltd.
Ambuja Cements Ltd. Hero MotoCorp Ltd. ONGC. Asian Paints Ltd. Hindalco Industries Ltd. Power Grid Corporation of India Ltd.
Aurobindo Pharma Ltd. HPCL Reliance Industries Ltd.
Bajaj Finance Ltd. I T C Ltd. Tata Consultancy Services Ltd.
BPCL ICICI Bank Ltd. Tata Motors Ltd.
Bharti Infratel Ltd. IOC Ltd. Tata Steel Ltd.
Bosch Ltd. IndusInd Bank Ltd. Tech Mahindra Ltd.
Cipla Ltd. Infosys Ltd. UPL Ltd.
Coal India Ltd. Kotak Mahindra Bank UltraTech Cement Ltd.
Dr. Reddy’s Laboratories Larsen & Toubro Ltd. Vedanta Ltd.
Eicher Motors Ltd. Lupin Ltd. Wipro Ltd.
GAIL (India) Ltd. Mahindra & Mahindra Yes Bank Ltd.
What are the Highs and Lows of NIFTY in the last 10 years? In the last 10 years, the NIFTY reached its top value in August 2017 and March 2017. Very recently I.e. in March 2017, the NIFTY was 9218.40. When the Chinese stock market was crashed in 2015, the NIFTY was effected very poorly thus showing a very low figure. It fell off by 490 points at that time, particularly in August of the same year. Moving a little further, in January of the year 2008, there was a sub-prime crisis, due to which the NIFTY fell more than 10% in one day. How can I use NIFTY to aid my investments? NIFTY in itself is a well-sound benchmark to trade in equity shares of companies in groups of 50 companies of NIFTY. The NIFTY give placement to those companies only which are performing outstandingly in the market and maintaining the quality and quantity standard. So, you can invest in Nifty based funds to get the long-term benefits. Same as Sensex, the stocks in the NIFTY are financially sound. Most of them are big blue-chip companies. You can invest in Best equity mutual funds that invest in these shares. Market Index is a reflector of the performance of stocks in the market. Just like Consumer Price index reflects the inflation in the economy and the human development index measures the development of the country, in a similar way, market Index also acts as the barometer to measure the performance of the market behavior. It is necessary because the market index helps the investor to make decisions regarding their investment because it gives them an indication that whether the stocks are doing well in the market or whether they will be able to provide them good returns. It can also be used by them for sorting and comparison of the various companies. You know that companies offer a number of shares to the public. These shares are offered at a certain price value. The multiplied value of the total shares with its price value becomes its capitalized value in the market, which is commonly termed as the market capitalization. Market capitalization in a layman language means that the company is operating its business all over the country valuing the total cost of shares. This is how; we came to know that whether the companies are able to perform well or not. If yesterday’s NIFTY stopped at 2000 and today it is 1880, then, it means that the company’s NIFTY value has gone down and that means that companies are not returning well. And if today’s NIFTY is 1880 and tomorrow it will stop at 2000, then it means that the companies NIFTY value has gone up and that means that companies are performing well and will return well. The Index is basically a tool to measure the change. The percentage of change needs to understand the changes in Sensex or Nifty as well. It indicates that how the companies have performed compared to their past performance. The construction of Index value is calculated as below. The value of the group of stocks gives the value of the Index. The group of stocks means BSE 30 or NSE 50. Any change in the value of these group stocks changes the value of the Index also. Here, free float market capitalization includes the value of only those stocks which are available publically for trade. Base market capitalization is the value of market capitalization of those companies which were initially listed in 1978-1979. The base value of Index in case BSE is 100, while for NSE is 1000. Company A has 100,000 shares trading at Rs200 each and B has 200,000 shares trading at Rs150. Hence, the total market capitalization is (200 x 100000 + 150 x 200000) Rs 500 lakhs. This will be equivalent to 100 points. Let’s assume that tomorrow, the price of A hits 260 (30% increase in price) and the price of B hit 135. (10% drop in price). The market capitalization will have to be reworked. It would be – 260 x 100,000 + 135 x 200,000 = 530 lakhs. That means, due to the changes in price, the market capitalization has moved from 500 lakhs to 530 indicating a 6% increase. Hence, the index would move from 100 to 106 to indicate the net effect. Sensex and nifty are India’s oldest index system. It includes 30 companies listed. Nifty 50 companies are registered under. India Index Services and Products Ltd. under it is index Sensex and Nifty both are indicators of market movement. Since inception in 1995, Nifty has given a return of 11.13% CAGR (till April 30, 2018). Beginners Investors are curious to learn about the difference between Nifty and Sensex. The prominent difference between the two is, Sensex is the stock market index for BSE limited, whereas Nifty is the stock market index for the national stock exchange. Another one is, Sensex consists of 30 stocks, while nifty is comprised of 50 stocks. IF YOU HAVE PASSION FOR STOCKS, INVESTING AND STOCK MARKET THEN I AM DELIGHTED TO SHARE MY KNOWLEDGE PERTAINING TO NIFTY AND SENSEX WITH YOU. I HOPE YOU HAD A WONDERFUL TIME READING AND LEARNING ABOUT “NIFTY AND SENSEX “TODAY. WE HOPE THAT YOU HAVE UNDERSTOOD THE BASIC CONCEPTS OF THE STOCK MARKET. IF YOU HAVE ANY DOUBT THEN YOU CAN ASK US BY COMMENTING ON THE COMMENT BOX. LIKE AND SUBSCRIBE US IF YOU WANT TO EDUCATE YOURSELF EVEN MORE BY US. THANKS FOR READING THIS. Happy Investing!